Beautiful Wales01341 280738work Self-cateringBEAUTIFUL WALES holiday barns are set within a 15 acre equestrian property. Both our self-catering properties are self-contained and have amazing views of Cardigan Bay. Sunsets are stunning. Walking is endless and the Coastal Path is in sight, as well as Snowdon and Cader Idris nearby. Coed-y-Brenin mountain biking centre is a short ride away. PENTY MOCHYN is a Five Star, two bedroom (sleeps 4 plus infant - one kingsize and 1 twin room) luxury barn conversion overlooking the beach and sea. The inteterior of the barn conversion is cosy and modern, with a spa bath and under floor heating for your comfort. Dishwasher, washing machine/dryer, fridge/freezer, microwave, double oven, digital TV with DVD player in lounge and all bedrooms, CD player, private garden, BBQ, outdoor seating, plus all the usual refinements expected of 5 star accomodation. PENTY BUWCH is Four Star, one bedroom (sleeps 2 + infant), stream-side cosy barn conversion with panoramic views from the decking overlooking the bay. The interior is a relaxation heaven and has a modern wet/shower room and full under floor heating for your comfort. Both cottages have dishwasher, washing machine/dryer, microwave, oven, ceramic hob, Digital TV, DVD player, CD player, iPod Docks, own garden, outdoor seating, large decking area with BBQ, plus all the usual refinements expected of 5 star accommodation (no bath in Penty Buwch - shower room instead). Heating, electricity, bedding and towels are inclusive. Dogs (extra charge) must be under control at all times (because of the free-range animals). Arrival is from 4pm (or 1pm if Early check-in is selected). The barns should be vacated by 10am on the day of departure (or 12noon if Late check-out is selected). Fantastic blue flag beaches that are never overcrowded are only a short walk away. Fantastic panoramic views of Barmouth and Llanaber beach from the moment you park your car and throughout most of the barn. Walkers and Cyclists welcome (Cycle Pod for your bikes). Footpaths, cycling routes and bike hire all nearby. Remote control blackout roof blind. BEAUTIFUL WALES holiday barns are set within a 15 acre equestrian property. Both our self-catering properties are self-contained and have amazing views of Cardigan Bay. Sunsets are stunning. Walking is endless and the Coastal Path is in sight, as well as Snowdon and Cader Idris nearby. Coed-y-Brenin mountain biking centre is a short ride away. Sun trap patio and decking areas. 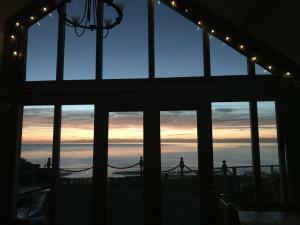 Holiday barns overlooking the sea of Llanaber with panoramic views from lounge and decking/patio. Surrounded by our rare breed animals - horses, sheep and chickens. Free range chicken hut in your garden where you can collect and keep fresh eggs and look after your own chicken (if you want). Children welcome from any age. Take the main A496 out of Barmouth towards Harlech, pass the Llanaber sign and then look for our sign on the right hand side. There are bus stops outside in both directions (ask for Plas Llwyd). There are train staions in Llanaber Halt (request stop) Half mile or Barmouth 1 mile. PENTY BUWCH The cottage is single storey but on three levels with two steps between the hallway and kitchen and a further two from the kitchen to the lounge. PENTY MOCHYN Two storey with standard 13 tread stairs linking the bedrooms and bathrooms (downstairs) with the open plan kitchen, dining area and lounge (upstairs). Staff are also available to help all guests with shopping and bags if required - just ask!